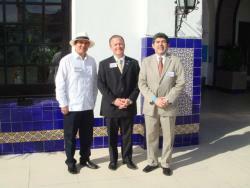 Held in the City of Rosarito, Baja California, Mexico on October 29, 2009. Erik Weichelt, San Diego Asociation of Realtors "SDAR" President 2009, Dianne Rath SDAR International Council President, and Lori Staehling SDAR 2008 President attended the meetings and exchanged information with local Baja professionals. Erik Weichelt, SDAR President, participated with his educational speech "How to conduct International Business on both sides of the border" In addition, Mr. Weichelt participated as a Witness of Honor during the signing of an Commission Referral agreement between the Baja Developers Association and the Consejo Estatal de Profesionales Inmobiliarios de Baja California, (CEPIBC). The SDAR delegation was greeted by Oscar Escobedo, Baja California Secretary of Tourism, Hugo Torres, Mayor of the City of Rosarito, Ricardo Bolio, CEPIBC President among other important representatives of the Real Estate industry in the state. The SDAR delegation participation during the Baja annual convention continues strengthening the professional business relationship between the associations and the implementation of the International Referral system among their members.